For your ultimate convenience the stroller and bassinet have a dual facing capability. 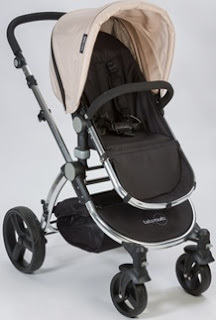 Its ONE OF A KIND folding mechanism allows for the bassinet and stroller to fold while attached to the stroller. This system will WOW you and your baby from infancy through toddler. The Baby Roues is a system that will ensconce your baby from infancy through toddler in complete luxury. The system includes a deluxe and roomy bassinet and stroller perched atop a sturdy aluminum frame. The Baby Roues system requires no fabric switching, resulting in convenience and minimum effort to switch any parts. The highest quality bassinet mattress, with 4 position reclining stroller, 5 point stroller safety harness, and contoured weather cover for stroller and bassinet, will ensure that your baby is safe, cozy and comfortable at all times. The newest technological front and rear suspension system, 10.5” and 6.5” rear and front PEVA wheels and 3 position handle height, will ensure ease of maneuverability and the smoothest ride for your baby. The stroller also includes a large basket for all your baby’s essentials. Enjoy walking proudly with your baby in the newest innovative Baby Roues system that technology has to offer.